I don't like the default Dash Button (also known as BFB in short of "Big Freakin Button") in Unity Launcher. It's pretty inconsistent with Faenza icon theme and I would like to change it. How can I do that? It is configurable. The unity icons are in /usr/share/unity/4. Please browse this folder with the file manager to see the thumbnails. Log out and log back in. You will see the new dash home. Definitely more customization could be done as long as you replace the correct files. Please backup the original files before making the changes. sudo find / -type f -iname "*dash*"
They are very different in size and name. I think you have to edit every squircle_ file yourself with an image editor like Gimp. To use the Ubuntu Touch Launcher icons / assets on the desktop (Unity), download the icons from DeviantArt and extract the downloaded archive in your home folder. I made a logo pack with icons collected from various sources like icon packs (Numix, Nitrux, Moka, Faenza and Captiva), Linux logo redesigns (by Reda Lazri, Dablim and Nattapong Pullkhow), official Ubuntu logos, Unity 7.2 and more. These logos are compatible with Ubuntu 14.04LTS "Trusty Tahr"'s Unity 7.2 and Ubuntu 12.04LTS "Precise Pangolin"'s Unity 5 and Unity2D. Should work with Unity 7.3 on newer releases like 15.04 "Vivid Vervet" and 15.10 "Wily Werewolf" too. I tried with svg, but a 128x128 png should also work. Then use the tweak tool to change the GTK theme for the icon to refresh. You can either create new replacements for the above svg files or copy the unity folder from GTK themes that already implement Launcher theming (Numix, Moka Orchis, Delorean Dark and Ambiance Touch to name a few) and place it in any GTK theme in ~/.themes. Now use an app like Unity Tweak Tool and switch to the theme you modified. 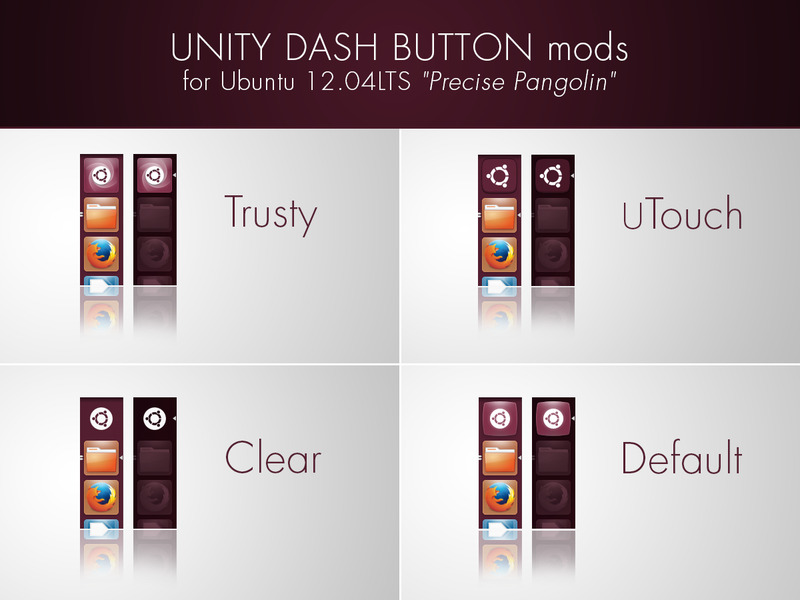 I made some Dash Button mods for Ubuntu 12.04LTS's Unity 5 and Unity2D using assets from Unity 7.2, Aerilius's Ubuntu Touch mod for Unity 6 and Ubuntu Touch SDK. 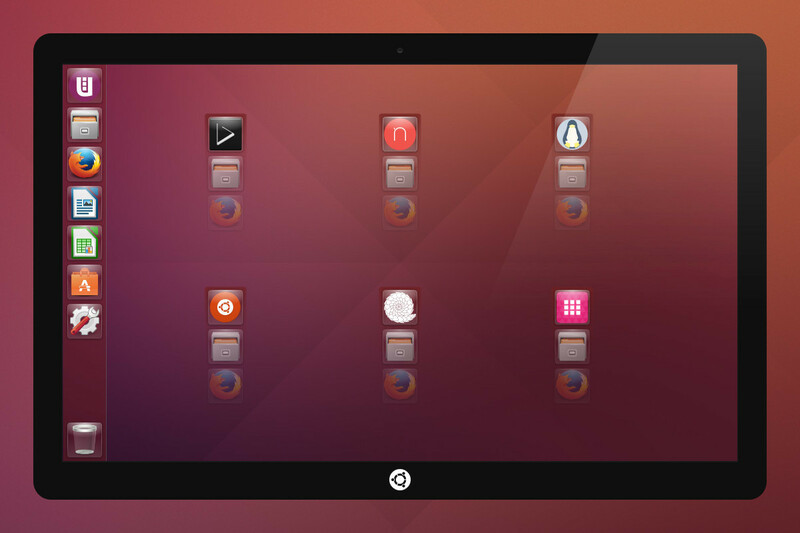 You cannot remove it as it is a part of the Unity Launcher code, Mark Shuttleworth explained the reasons behind the Dash icon and its place in the Launcher in his blog post here. The icons are at /usr/share/unity/4/. You can change them with your preferred png icons. Not the answer you're looking for? Browse other questions tagged unity launcher unity-dash or ask your own question. How to change the dash icon in Unity 15.04 to a custom .png? How do I change the software center icon in the launcher? Can I remove 'dash home' from the Unity launcher? Can I change or replace Unity Launcher Dash behavior? How to pin Unity-Dash on Plank dock bar ? Alternatives to Dash?